Also known as: CAT5 VGA video splitter, video multi-point extender, audio video port expander, cat5 vga splitter, monitor splitter, vga video splitter, extend multiple monitors, VGA video distribution over cat 5 wiring, share video, split vga video, video splitter hub. 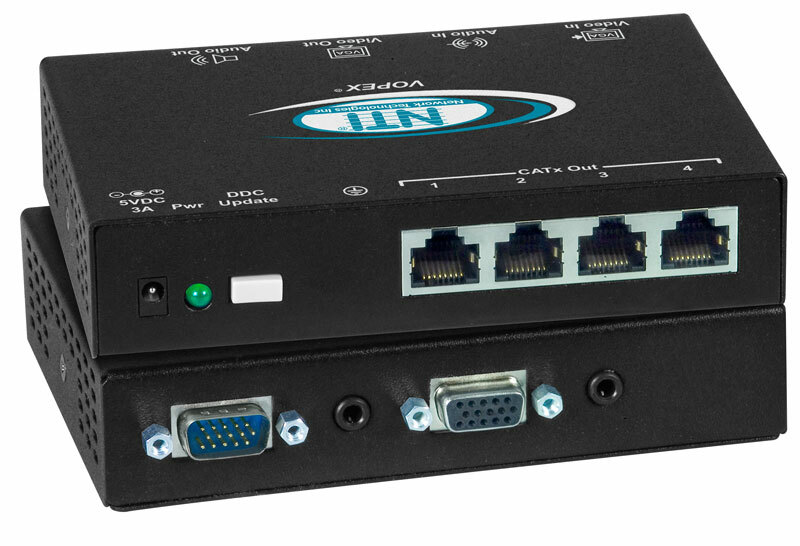 The VOPEX® VGA Video Splitter/Extender simultaneously broadcasts high-resolution VGA video from one computer to 4 or 8 remote monitors located up to 1,000 feet away using CAT5/5e/6 cable. Audio can be broadcasted to self-powered stereo speakers at the local unit and each remote location when using NTI's remote units with audio option.